Back to School Nights are approaching - they can be nerve racking for teachers and overwhelming for parents. 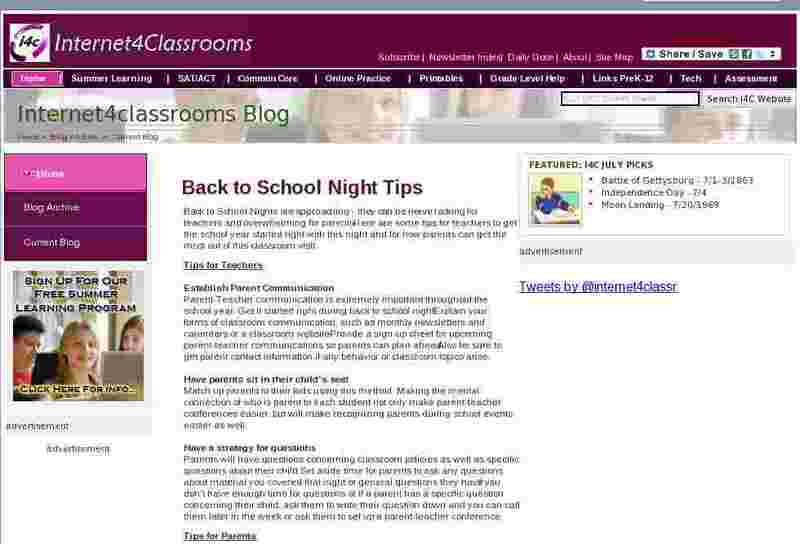 Here are some tips for teachers to get the school year started right with this night and for how parents can get the most out of this classroom visit. Parent-Teacher communication is extremely important throughout the school year. Get it started right during back to school night. Explain your forms of classroom communication, such as monthly newsletters and calendars or a classroom website. Provide a sign-up sheet for upcoming parent-teacher communications so parents can plan ahead. Also be sure to get parent contact information if any behavior or classroom topics arise. Match up parents to their kids using this method. Making the mental connection of who is parent to each student not only make parent-teacher conferences easier, but will make recognizing parents during school events easier as well. Parents will have questions concerning classroom policies as well as specific questions about their child. Set aside time for parents to ask any questions about material you covered that night or general questions they have. If you don't have enough time for questions or if a parent has a specific question concerning their child, ask them to write their question down and you can call them later in the week or ask them to set up a parent-teacher conference. Devise a strategy if you need to visit more than one child's classroom. Back to School Nights can be tricky if you have more than one child at the same school. Be sure to strategize before arriving that night. If you've already had one teacher before, you may decide visiting a new teacher is the priority for the evening. If both parents can attend, you can split up and then go over all the important information together at a later time. If you can't visit both classrooms, set up a meeting with the teacher you can't visit at a later date to go over classroom policies and any questions. Be sure to get the teacher's contact information! Write down anything that you'll want to remember about later - volunteer opportunities, attendance and homework policies, grading, testing, etc. You may also want to jot down questions that you have about the information the teacher is going over. Now is the time to ask any questions about homework policies, discipline policies, grading, how to contact the teacher, and more. Don't ask specific questions about your child though! Remember that the back to school night is not just for you, it's for all of parents in the classroom. If you want to discuss any concerns or questions about your child's performance, set up a parent teacher conference with the teacher.